What happens when good men go bad and bad men go good? Mad Grey Dawn gives us two stories involving our villains. The first is on how the future Riddler will rise, beginning his evolution to super-villain. The second is on how the current Penguin is working to be a sweet, kind man. The fact that we get two real great performances out of them (and out of others in the cast) pushes Mad Grey Dawn to being a nearly brilliant Gotham episode. Oswald Cobblepot aka The Penguin (Robin Lord Taylor) is truly attempting to be the sweet man Dr. Hugo Strange has programmed him to be and that his late mother has wanted him to be. If it means crashing his former home, now run by Butch Gilzean (Drew Powell) and his...mistress, Tabitha (Jessica Lucas) with a peace offering of cupcakes, so be it. Tabitha wants to kill Penguin right away, but Butch sees Oswald is too far gone to be any harm. That doesn't mean there can't be a little torture a la tarring and feathering (I guess Pengy got off light in the great scheme of things). Anyway, Oswald goes to his mother's grave for the first time, and his private time is interrupted by Elijah Van Dahl (Paul Reubens). He too has come to mourn Gertrude Kapelput, and when he meets Oswald Cobblepot Elijah looks a bit puzzled by the similarity in their names (Oswald having Anglicized her Germanic surname). Learning Oswald is 31 years old (FYI, RLT is 37 in real life), Elijah puts two and two together and makes a shocking announcement: he is Oswald's father. Gertrude and Elijah had an affair when both were very young, and while the scion of a wealthy family loved the family cook, the Van Dahl family ordered them to separate. Elijah never learned about Oswald. Now, Oswald has found a home, a father, and even a new family...a stepmother, Grace (Melinda Clarke) and stepsiblings. Things are looking up for Ozzie at last. Pity the same can't be said for either Detective Gordon (Ben McKenzie) or Edward Nygma (Cory Michael Smith). Nygma is growing more and more paranoid that Gordon will come close to finding the truth about Kristen Kringle (that she's dead and Nygma killed her). With that, Nygma comes up with a rather elaborate crime spree involving riddles, but there is a greater plan in store. Nygma, slowly and methodically, is putting together a puzzle that will lead Captain Barnes (Michael Chiklis) to a right and wrong conclusion: that Gordon killed former Mayor Theo Galavan and now is starting to kill those who are leaving 'anonymous' tips. 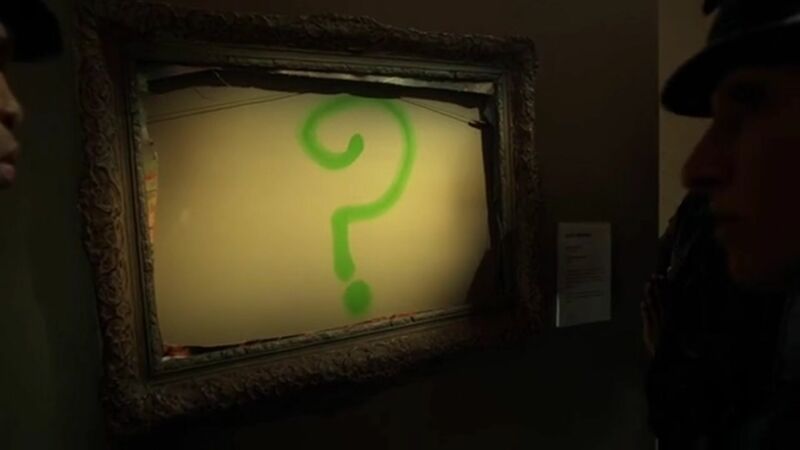 The first step in Nygma's master plan is to steal a minor painting from the Gotham Museum of Art, Mad Grey Dawn, leaving a question mark as a signature. Gordon is able to put the various pieces together that lead to a bomb at the train station, but even this is still part of a larger plan to frame Gordon for a crime he didn't commit (to bring attention to the one he did commit). Barnes, finding Gordon over the body of the detective who allegedly was the anonymous source, arrests Gordon (again; seriously, how often will the future Commissioner end up in the slammer himself). After a four-week trial, Gordon is found guilty of the murder of Officer Pickney (can't remember if he was found guilty of murdering Galavan too) and sent to Blackgate Penitentiary. Watching this is Bruce Wayne (David Mazouz) and Selina Kyle (Camren Bicondova), who has taken young Master Bruce under her claw to show him how to live on the street. If it means taking on Butch's nephew Sonny (Paul Pilcz) so be it. Getting beat up by Sonny appears to enliven Bruce, especially when Sonny unwitting brings up Bruce's parents. Looks like he could use some of the mushrooms little Ivy Pepper (Clare Foley) is growing for Sonny. I may pick on Jim Gordon, but that is only because I hate the idea that this trial went by in a blink-and-you-miss it manner. It just seemed like maybe the trial could have gone on for at least an episode (wouldn't it have been great to have a surprise witness appear, or is that just me). Perhaps my one caveat about Mad Grey Dawn came from Gordon. He was obviously highly intelligent (he must be to have not only put Nygma's clues together but had enough French to realize that's where the clues were leading). He was brighter than his partner Bullock (Donal Logue), so Nygma at least knows his man. Still, with two stories going on (Penguin's road to redemption and Bruce's road to the Batcave), and with Nygma's machinations going on, part of me wondered if Gordon, forever growling (to where he would order his great love Dr. Thompkins to not contact him as he goes up the river), was going to get lost a bit. He wasn't, as the cat-and-Riddler play between Nygma and Gordon was fascinating to watch, but still, I cannot muster great enthusiasm for Gordon. I think that also comes from the fact that we had such great performances from everyone, regular and guest cast. 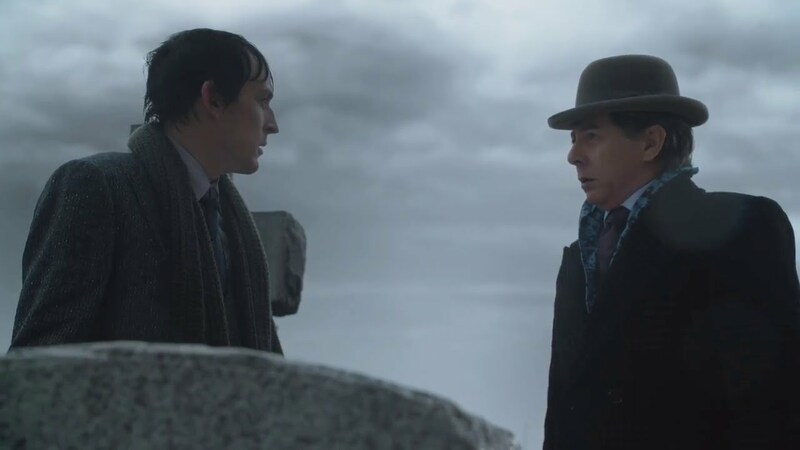 For those of you not in the know, this is the second time Paul Reubens has played the Penguin's father. In Batman Returns, Reubens had a cameo as the deformed Oswald Cobblepot's father. While in Batman Returns, Reubens had nothing to do but strike poses, here he plays the regretful man who now seems to have found a son he never knew. The realization that he's Oswald's father doesn't come across as forced but as natural, and Reubens is eerily good as Van Dahl. Reubens makes him just eccentric enough without making him full-on crazy in the way someone like Oswald's parents would be. Let's face it: as much as I loved Gertrude, she was a bit oddball. I also highly salute CMS as Nygma, who makes the future Riddler almost a tragic figure, brilliant in his mastery of the elaborate plan, but also one who has finally given in to that darkness that was lurking underneath his bumbling exterior. Another highlight is Chiklis as the upright Captain Barnes. As he and McKenzie face off in the interrogation, you can see two great performances. GIVE ROBIN LORD TAYLOR THE OUTSTANDING SUPPORTING ACTOR IN A DRAMA EMMY FOR GOTHAM!!!! How many exclamation points do I need to emphasize reality? His entire performance, from the sweetness, almost total innocence of his encounters with Gilzean/Tabitha and Nygma, the joy at his new-found family, and the pain of his visit to Gertrude Kapelput's grave...THESE are what we call 'masterpieces of acting'. RLT is just so brilliant on Gotham, that it makes me think if he were on any other show he'd be a virtual shoe-in for a nomination. I simply don't understand why he isn't a frontrunner. It can't be because it's a comic book-based show (the highly praised The Walking Dead is from a graphic novel). Therefore, what it is? Robin, send Mad Grey Dawn to the Emmy people. Even thought they weren't a big part of the episode, Mazouz and Bicondova were also great as we see the evolution to Batman come closer to fruition. Not sure about the nephew bit, and being Sonny to boot. Still, even with that and with the rapid nature of the Gordon trial, Mad Grey Dawn is one more Gotham episode in a series that is doing so well. Here's hoping The Riddler and The Penguin grow to the villains we all know and love.